Hi Dave. Welcome to the Forum. I am glad you are not going for radius 1 curved track. I had a curve on my layout that was between radius 1 and 2. It gave no end of trouble for one loco in particular (and if truth be known to others also). So much so, I was blaming the locomotive itself. Eventually, I got round to replacing the curve to radius 3. Success! Yeah I think i'll keep it wider to avoid this very problem at the start... Radius 3 it is! A quick question if I may........ Whats the maximum incline a train can climb? Depends......on how big a train you want to pull up it! To cross a railway, you need the height of underlay, track, tallest rolling stock plus thickness of bridge/tunnel above it, ranges from about 3-4 inches. Hornby will make you believe you can make an overbridge in 180° on 2nd radii! I doubt you would get an engine and two carriages to make at full tilt, even with a run up! There are lots of figures out there ranging from 1:30 to 1:40, but even these are debatable. Even 1:60 will cause wheel slip if the train is long (8 carriages). One solution is to use 'DCC Concepts Powerbase', but that means fitting magnets to every loco. P.S. having a curve on the incline will adversely effect (reduce) the pulling power too! Hardly worth me adding my thoughts as TimberSurf has covered comprehensively. Particularly regarding a curve in a climb, something often overlooked. freight trains and gradients can be a nightmare with runaways from coupling failures. But gives scope for your railway to go over bridges and along embankments. Just feeding you ideas - every decision is up to you !! Thanks Geoff, but I forgot one! Never seen your layout during the build Geoff! I like the weight reducing holes! 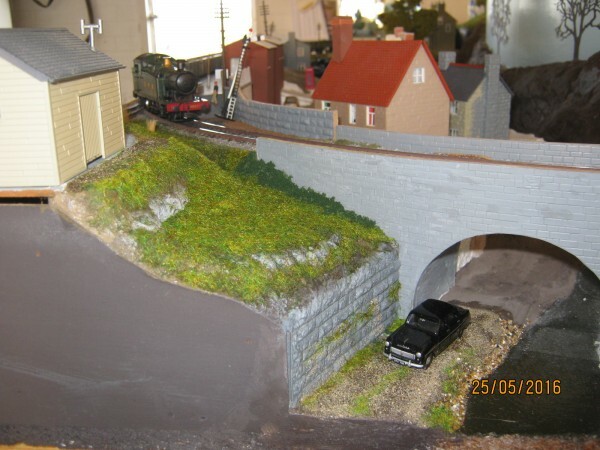 In a similar vein to what Dad-1 says about scenic levels, there is a good concept that can help for track. It's very hard to describe. In your case, a horse shoe, it would mean single level track on one side, with two lines running to the other, splitting as two levels were they could then cross over each other on the other leg. Coming a little late to this conversation I would echo suggestions that in the space you have, flexitrack and live crossing points from Peco are the way to go. As for the gradient question, it is not such a problem if going all 1970s diesel traction in Essex. The classes you would most need: 20, 31, 37, 40, 47 are all available with the heavy centre motor driving both bogies mechanisms which will pull the side out of a house. The 31 from Hornby, the others by Bachmann. Should there be other classes you need nearly 'everything' in diesel traction is now available RTR in this form. If you can stick to 1 in 40 they will have no trouble at all with full size trains. If you haven't seen this type of drive yet, you may be impressed. (The mechanism designs originate from American HO, where 40 bogie wagons per freight loco on level track was the expectation.) There is a choice of DMU's available too, the Derby lightweight, 101 and 105 probably most appropriate? Available BR yard shunters are restricted to 03 and 08, and won't do so well on 1 in 40, and neither will many steam locos, in case that matters. Wow.. much to absorb there! I must re-read the last several posts again. Kind of went in.. but think it kind of flew out again. Thanks for taking the time to write these posts by the way.. Although many of these basic questions you are asking get repeatedly asked (in a roundabout way), so I think I need to write them up on some guide pages on my website, so I and others can reference them repeatedly. But don't stop asking, before you start a layout is the best time to enquire! TimberSurf wrote: Although many of these basic questions you are asking get repeatedly asked (in a roundabout way), so I think I need to write them up on some guide pages on my website, so I and others can reference them repeatedly. I love to experiment with what I have (E.g. locos and stock) and trying them the manual way. Is best to take the widest, longest, tallest and as far as locos go with gradients and pulling power, the lightest least powerful loco to test gradients, sharpest curves, space restrictions and the like. 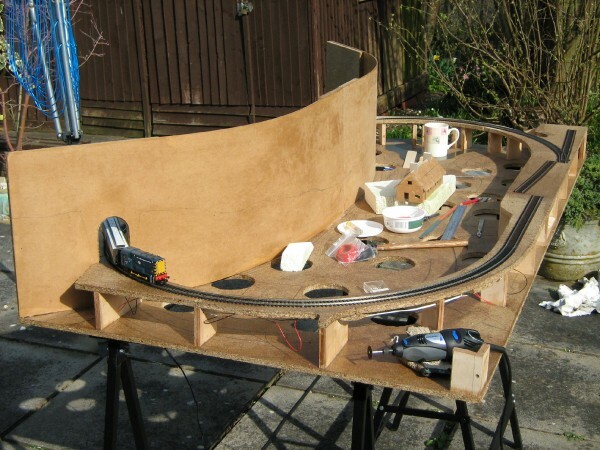 By doing this I get an idea of what gradients, curves etc are feaseable, not to mention train lengths for passing loops and sidings etc., all of which are useful information when working out ideas for a layout. As far as gradients are concerned, I would consider a medium gradient so my locos have to work hard and even double head heavier trains, but not as steep so that not a lot can get up there. A happy medium is a good mix. For curves (Which may make more sense for me as my models are not factory made models) I take the longest vehicles I intend to use (Ones that have the longest wheelbase) and if they can get round I am happy. I may take the curves to the max sharpness they will cope with and then relax a little so that the go round easier. I then build new builds so that they do not exceed (Or are less then) the wheelbase length that the tested vehicle has. It is all experimenting and enjoyable. Where the difficulties can come in is where one only has a limited amount of stock to test. For example, if one intends to run a ten coach express up a gradient (Which is probably the heaviest most of us would attempt) without double heading using an express loco like a Castle or a Duchess or where a diesel loco is concerned, a class 47 or Hymek etc, then one does need enough coaches to do such a test. One can use a mix of aagons and coaches to similate an equivalent weight. Now not all locos will pull anything like the real locos will. From what train drivers told me they missed the Hymeks when they went, as though they looked small they could pull a 16 coach express train out of Paddington towards Wales (Which was in excess to their normal loadings for such a teain) and not even struggle to keep to time, while when they were replaced with a class 47 they would pull such a load but there was no hope of keeping to time. Now in model form in 00 gauge (As an example) a Heljan Hymek has all wheel drive so has a hope of pulling a ten to twelve coach train up a gentle incline. An old Triang Hymek may manage around eight if the coaches are freely running and it is on steel track so the magnadhesion will be put to use. On nickel silver track they would struggle to haul six. A later Hornby ringfield type loco will haul eight if it has decent traction tyres. If not then it will struggle. Now these are the maximum expected from such locos on the flat or up gentle gradients. (I expect the Heljan version may pull more but I have never had one. I do have similar locos as an estimate). Now increase the gradient and the locos pulling power will be less. Some may struggle with a four coach train. There's something to be said about older coaches, especially Lima and a few Hornby coaches made during the 1980's to '90's. They do tend to run nicely. and generally behave themselves, especially Lima. I don't rate the lovely fine detailed modern coaches as well as though their detail is outstanding, I found the close coupling system which is now used in modern designs to be problematic, especially if one has sharper curves (They are normally designed to take 2nd radius curves but one really needs 3rd raduis or greater while the old Lima and old Hornby coaches will wizz round sharp 1st radius curves at speed, even being pushed from behind). To me the running capabilities are more important then the finer details and thus I prefer older coaches. Locos? Well... Many modern ones are superior, especially for slow speed shunting, but don't expect them to like sharp curves. Wagons? Well, if anything it is wierd. Some modern model wagon designs have a larger gap between vehicles then the older models did, which doesn't (Or shouldn't) be an issue with its running qualities, and usually thwy are better, but I will say, older wagons can be vastly improved by changing to metal wheels.